“His intention was to take the house back to what it originally should be, but update it to make it more comfortable for modern times,” says Merah. Designed by William Krisel A.I.A., the house was built by the Alexander Construction Company as the second phase of a tract housing subdivision once known as the El Camino Estates. The previous owners added two rooms off the kitchen, which Chris promptly tore down to restore the home’s original 40’x40’ footprint. 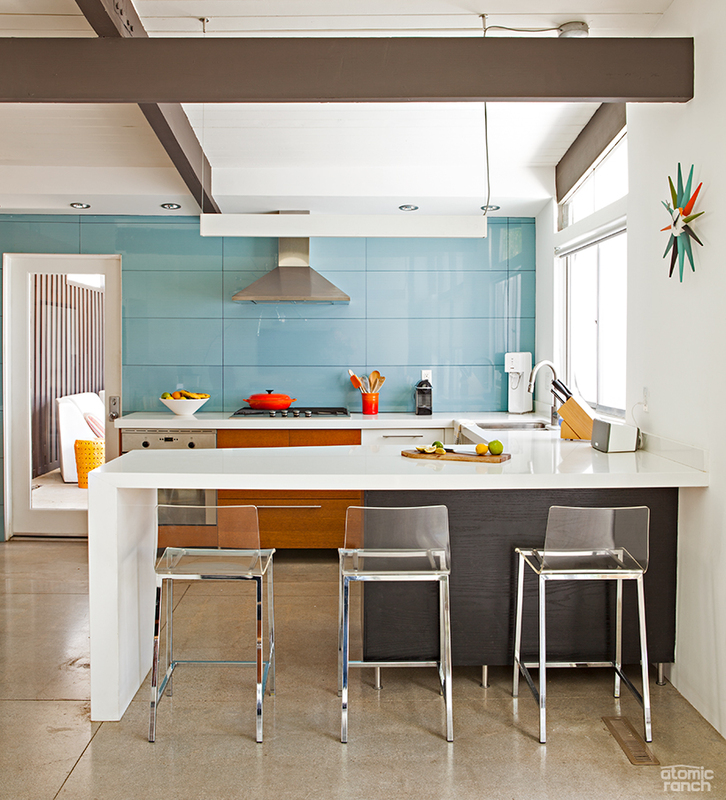 He also removed an interior wall separating the kitchen and dining room to create an open living space. “His intention was to take the house back to what it originally should be, but update it to make it more comfortable for modern times,” Merah says. 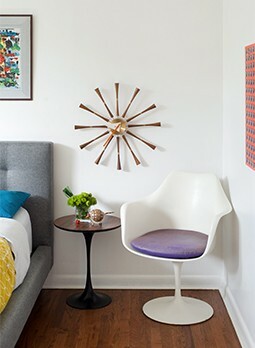 Other renovations included stripping the linoleum tile to reveal the concrete slab underneath, and updating the bathrooms and kitchen with modern fixtures that retain a 1950s air. “He kept the [kitchen] cabinets, but he replaced all the countertops with Caesarstone,” Merah says of her husband’s handiwork, adding that the cabinets are from Ikea. A custom walnut veneer sofa and chair from Futurama flank the stately gas fireplace in the living area. 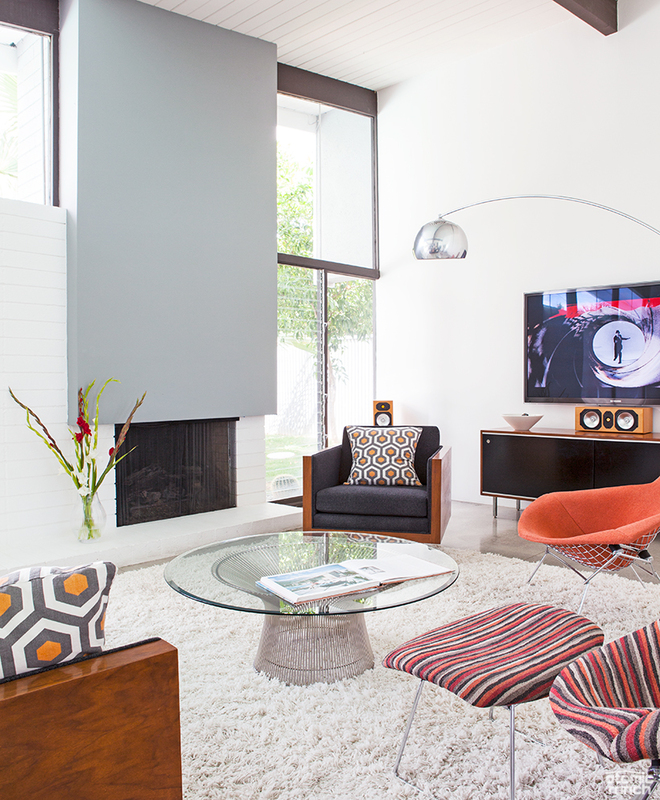 The owners picked up the vintage filing cabinet (now used as their entertainment center) by George Nelson for Herman Miller at the Palm Springs shop Retrospective, while a glass Platner coffee table from Design Within Reach provides ample space for cocktails. 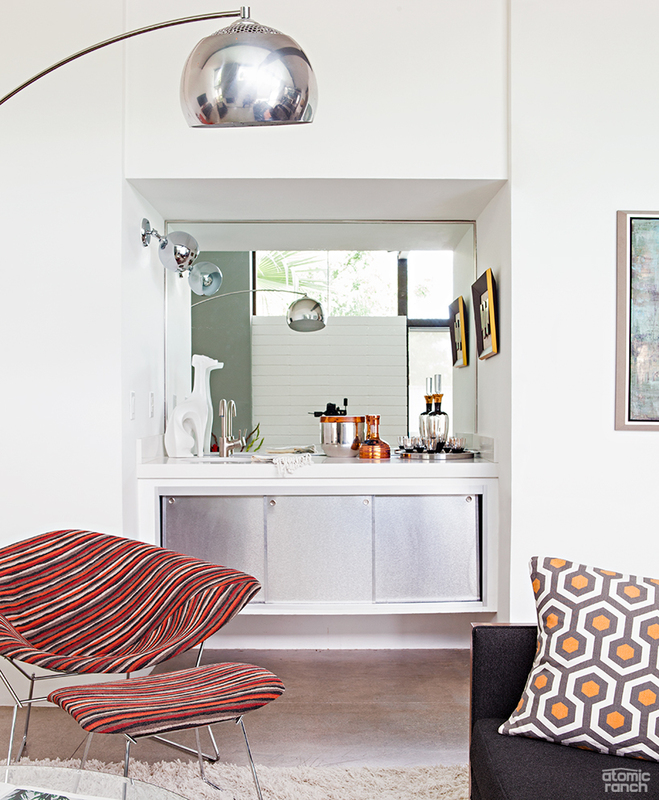 The built-in wet bar in the living room was original to the home and provides an inviting backdrop to a reproduction Bertoia chair with matching ottoman with vibrant striped upholstery. With a meticulous attention to detail, Chris designed the waterfall counter to match the thickness of the ceiling beams and chose a period blue Porcelanosa ceramic tile for the kitchen and master bath. He also used Caesarstone on the living room wet bar, which is original to the house, and for the custom-built outdoor bar on the back patio. 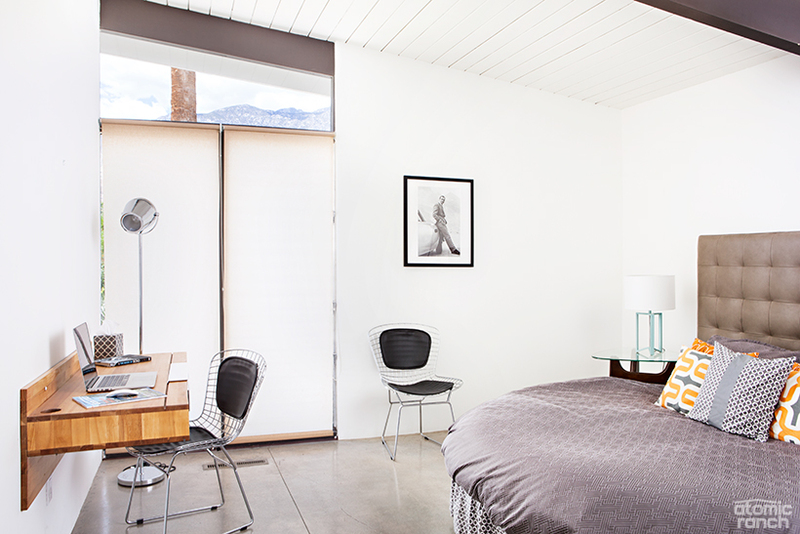 The floor-to-ceiling windows and high tongue-and-groove ceilings were left untouched, both preserving the home’s light and airy feeling and maximizing the views of the San Jacinto Mountains. “It’s only a 1,600-square-foot house but it feels so much bigger, because of all the glass. It has such a nice flow,” Merah says. But the exterior is a thing of beauty in and of itself—particularly the surrounding neighborhood and landscaping. Each of the homes in the subdivision is angled to highlight the landscape and create a seamless transition between the interior and the natural surroundings, Merah notes. The different rooflines also give the impression that each residence was a custom home, even though they all share the same floor plan, part of Krisel’s ingenious design scheme. In addition, the architect avoided the use of soffits, but instead ran all electrical and plumbing under the concrete pad. “That allows for the walls to go straight up to the ceiling with the butterfly roof. You don’t have to have anything in the way—you can have just walls of glass,” she says. The Bonds hired a landscape designer to reimagine their front yard, then scrapped his plan and started from scratch. Barrel cacti line the entryway to the fiery orange front door. The owners added white wooden slats to the existing beams connecting the house and carport, accentuating the sloping roof. 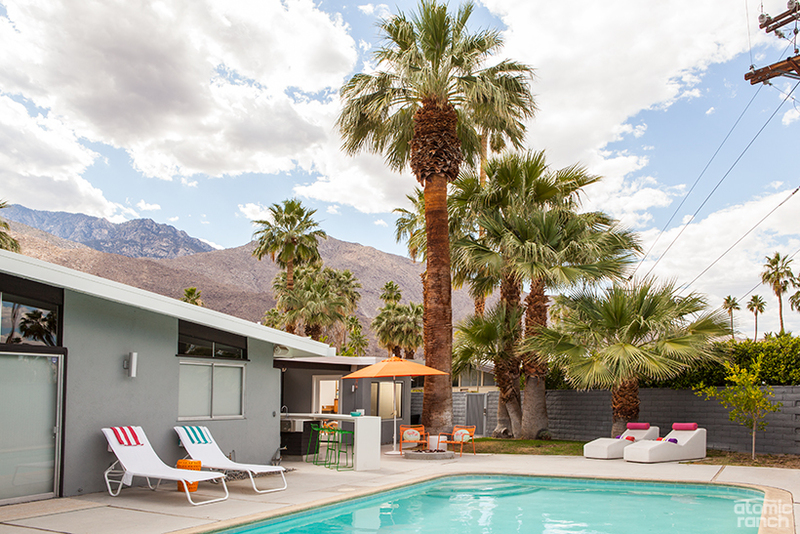 Chris Bond designed the Caesarstone custom outdoor kitchen and bar on the back patio, setting the counter at the same quirky angle as the property line. Oversized La-Fête chairs covered in white marine vinyl are both practical and comfortable for lounging by the pool. 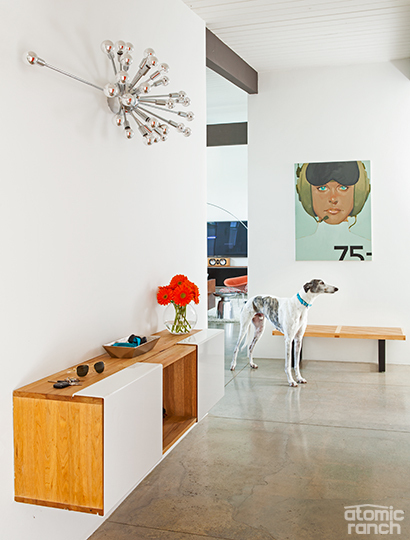 Merah helped Chris choose interior furnishings that mirror the home’s midcentury roots and played an integral role in upgrades to the home’s exterior. “The landscaping when he bought the house was pretty much a pile of gray rocks,” she says. 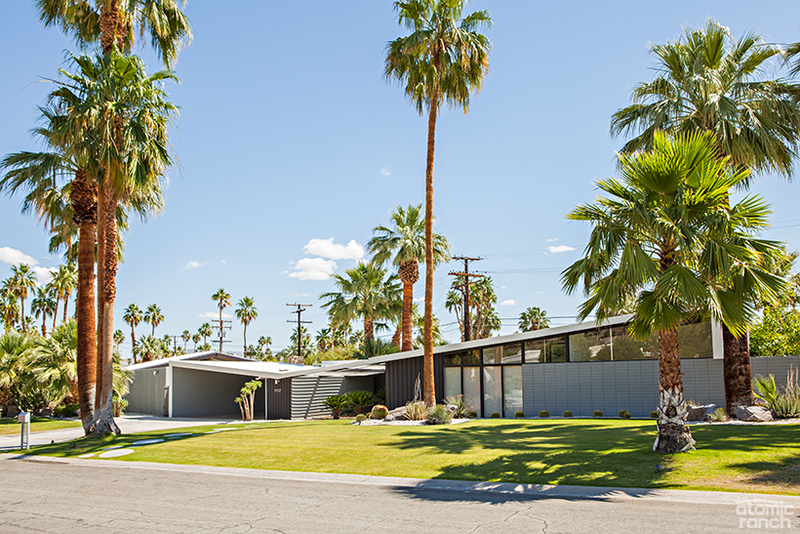 The couple removed the rubble and several palm trees, placing large circular pavers across the lawn and barrel cacti leading to the entryway. 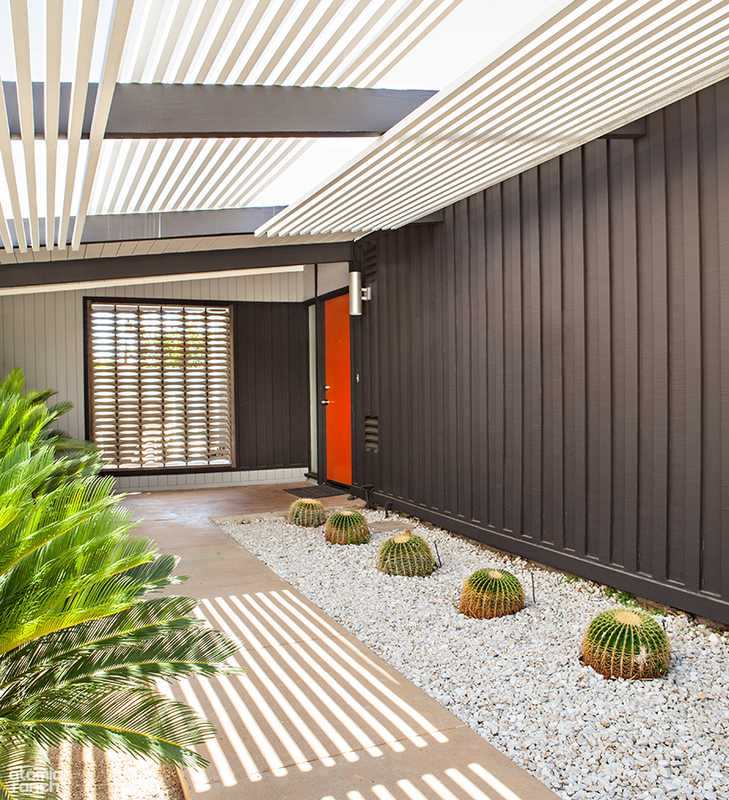 They also added slats to accentuate the white beams running between the house and the carport and installed a sunshade that offers a sneak peek of the swimming pool and deluxe outdoor kitchen in the backyard. 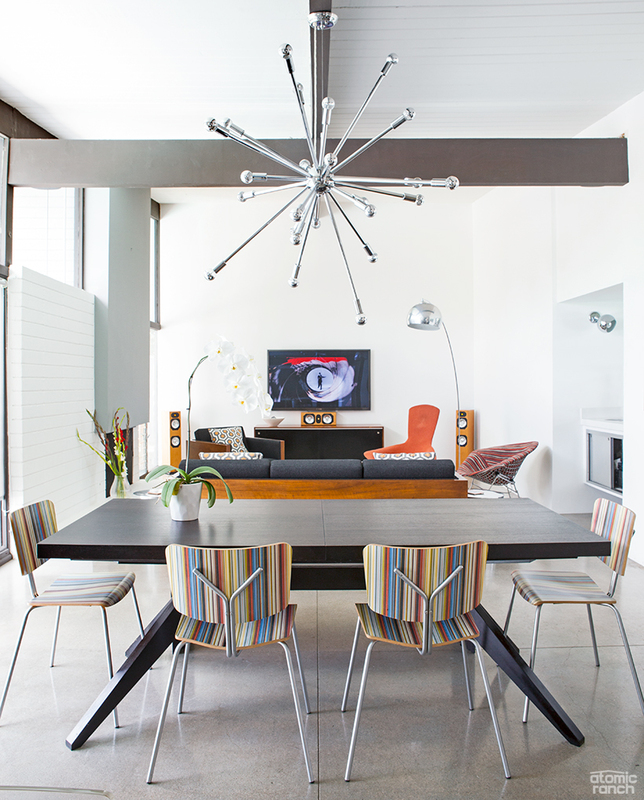 Three vapor acrylic barstools from CB2 draw attention to the white Caesarstone waterfall counter, designed by Chris Bond, which mirrors the lines of the original ceiling beams. The blue Porcelanosa ceramic tile from modern home design showroom was also used in the master bath.